When I am not shooting photos or driving a desk at work, I am often involved in one form of dance or another. 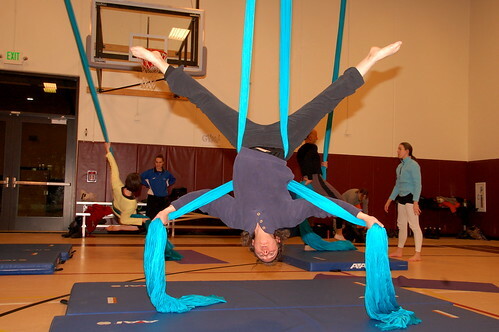 For the past three Wednesdays I have been taking a crash course in aerial silk dancing. OK, for my skill level calling it dancing is really (really) stretching it, but that is what it is regardless of what I am doing to the form. 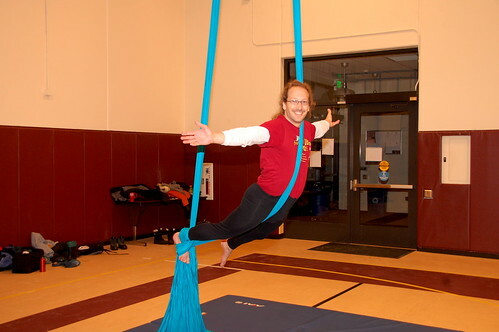 We use the gymnasium at the new Goodman Center. It is a nice enough space, but whoa!, is it ever chilly in there. There is a constant doffing and donning of clothing depending on our activity level moment by moment. Instructor Gini has a pretty nice little series of exercises and drills to teach us some basics, then because we are all overachievers of one sort or another, she feeds us a technique that lets us apply the skill we just learned. Most of what we are doing is at low level, often just a foot or so off the ground, and always over crash pads, and often with a spotter until we get comfortable. Safety first! 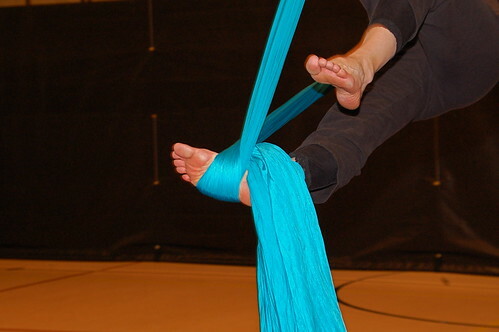 One of the first key things we learned, or refreshed ourselves on, was getting a secure foot lock in the silk. This foot lock allows hands-free manuvering off the ground. It is the basis for any number of 'next step' moves. Establishing this foot lock seems quite complicated at first, and uses up a lot of hand and arm strength until one gets a level of proficiency. 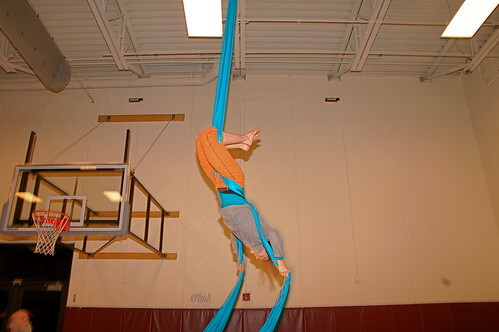 The class was great fun, and I look forward to my next experience with aerial silk. In the meantime I have my memories, and this shot of me that Don took. Thanks, Don!